Republicans were much more skeptical of the background checks bill than a more general background checks proposal. While 81 percent said they supported making private gun sales and sales at gun shows subject to background check, far fewer (57 percent) wanted the Manchin-Toomey proposal to pass. Among Democrats and independents, there was much less of a drop-off in support for the legislation. In addition, overall public support for gun control has declined in recent years. From the 1990s through 2008, majorities consistently said it was more important to control gun ownership than to protect the right to own guns. But support for gun control fell after Obama took office; beginning in 2009, roughly equal percentages prioritized gun rights and gun control. This changed in the immediate aftermath of the shootings in Newtown, which took the lives of 20 elementary school students and six teachers and administrators. In both late December and January, higher percentages said gun control was more important than gun rights, for the first time in Obama’s presidency. By May, however, the balance of opinion was back to about even, or about where it had been before Newtown. Moreover, gun control opponents were more politically active and engaged on this issue than were gun control supporters: 41 percent of those who prioritized gun rights over gun control said that they would not vote for a political candidate with whom they disagreed on gun policy, even if they agreed with them on most other issues. By comparison, fewer gun control supporters – 31 percent – said they considered gun policy a make-or-break voting issue. Even after Newtown, the odds were long against Congress passing meaningful gun control legislation. If the Manchin-Toomey bill had survived the Senate – 54 senators voted for the bill, not enough to overcome a de facto GOP-led filibuster – it would have faced dim prospects in the Republican-controlled House. But public opinion also was a factor. It is rare when Congress rejects a proposal that draws support from 90 percent – or even 80 percent – of Americans, as Obama observed. But in this case, other public attitudes mattered as much, if not more. Next entry »Are U.S. voters really turning isolationist? "no body is going to take your guns" Right;l see NYC and they knew right where to send the letters because of registration. If you could just call up your local sherriff and see if someone was OK to sell too, that would be great but its not like Joe Biden says it is. It's registration so that the government knows where they are, so they can pick them up when they make certain types unlawful. That's exactly it! Registration leads to confiscation. Why have the surveillance camera videos never been released. It is common as dirt to make them public. The only reason I can think of for this abnormality is that the cameras do not show events as portrayed in the official story. If they are in accordance, release them and everyone will shut up. Comida para pollos y fertilizantes para maiz con Nanotecnologia. Stock up while you can on guns, ammo an reloading supplies. The SOB's are not going after the criminals; they are going after the law abiding and taking their guns. And the sky if falling. Don't forget that. Whether this tragedy changed peoples' minds or not, these tragedies are inevitable since we're living in a sick society today in spite of what what Ronald Reagan said to the contrary in 1981. We just have to accept it. We don't have to 'accept' anything like these tragedies. When Israel had a problem with terrorists shooting up schools they trained and armed their staff. everyone from teachers to bus drivers to janitors. These 'good guys with guns have stopped every school attack since this policy was put in place. We have no problem with armed security (usually minimum wage with no training) being present in banks, shopping malls and other areas of daily life. Just because teachers, principals and other staff don't wear uniforms, doesn't mean they are somehow 'unfit' to guard the lives of their charges. We've already seen that they will lay down their lives trying to protect them. I like your comment. Regardless the mentally deranged and misunderstood in or country, until the middle east and others stop bombing they're own people, sending our soldiers home in body bags and our country and others stop selling arms to governments that keep killing for political interests, thank you, I'll keep my guns and protect my family. Good luck taking them. I lived in Chicago for years, never had a gun there but i saw such corruption, greed and conflict. It reminded me of the middle east at times in a small scale. I see the fear it would cause a government to have an armed people with a difference of opinion but, we are a democracy and should always remain the right to be free without absolute control. Pushing for that gun control to enslave Americans ? The cause of all these tragedies is mental illness but that is too intelligent a discussion which you censor so it appears that gun control is the only salvation. Well , it did go through, good. Did Piers finally get it that the AR 15 was not used in the shootings and was found in the car ? It seems that you can not keep even this part of the story right. What weapons did Lanza use to kill the people in the building ???? PISTOLS ??? It only scratched the surface of public opinion about gun control. Politics has muddled up the may issue which is public safety. Is the public safer with more background checks? My answer is yes. Perhaps we need to start checking the backgrounds of legislators that are against these checks. More gun control measures failed for one simple reason. Anti-gun Liberals added way too much to the demands for what they termed "sensible" gun control. They mixed in gun bans and restrictions in with what should've been just universal checks and mental health reforms. Some Democrats are gun owners and will not give up their gun rights regardless of what the Democratic party wants. In the end more guns were sold by the fear generated by the gun bans than by any gun advertisements. I can't remember ever going to a gun store and being told that there are 2-4 million units on back order for the various rifles and handguns until this last push to ram through all these restrictions. In the end common sense lost out. If the leftist wackos (which excludes the millions of reasonable Americans who belong to the Democratic Party) and lazy media types had really thought about it, their efforts would have been far more effective and meaningful if their crusade had been one of reducing gun violence instead of imposing more gun control. According to the FBI, since 1992 gun related violence has decreased by over 50% yet during the Senate hearings this past January I'm not aware of one politician who brought forward this amazing fact and asked, Why did it happen and what can we learn? But alas, Democratic politicians are just as unimaginative and self serving as their Republican counterparts. And the media are, we'll this media is just lazy. 1. The so-called background checks suggested by Toomey and Manchin are bureaucratic minefields designed by Chuckie Schumer et al. to harass the law abiding and work toward registration and hence confiscation. A workable system would empower a law abiding gun owner to confirm with no cost or registration involved that the buyer was not a prohibited person. 2. In the voting for the Toomey Manchin amendment process, an amendment that made national concealed carry was voted down with the 57 yeses against 54. 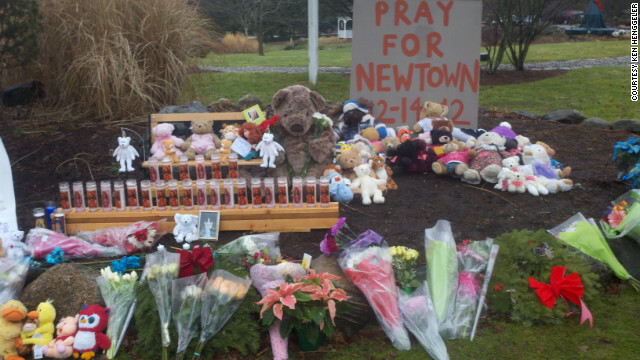 Why should Newtown change public opinion on gun control? What gun control would have prevented Newtown? This isn't about gun violence, it's about violence an mental health.